A movie that stars the great Emma Thompson should be enough to get you in our seats, but fine. We'll tell you about the movie. 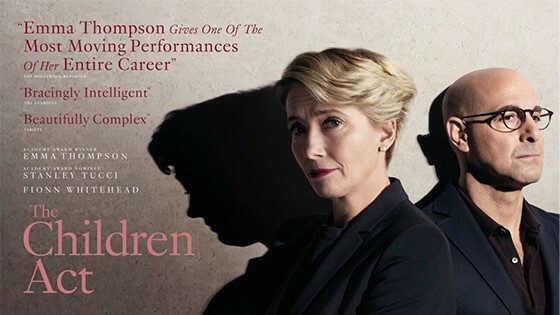 The Children Act features the great Emma Thompson as a judge presiding over a case of blood transfusion. Most blood transfusions aren't a big deal, but this one could save a teenager's life, and the parents don't want it. Neither does the teenager. Meanwhile, Judge Emma's marriage to her devoted husband Jack (Tucci) is beginning to unravel due to her excessive workload. Based on the novel of the same name, The Children Act is a brilliantly acted and emotionally challenging look at the conflicting rights of religion and state.